A new publication by The Great Transition Initiative provides an inspiring vision of a more equal, vibrant and sustainable civilisation. From STWR’s perspective, its missing element is a sufficient focus on the critical needs of the very poorest citizens—which could ultimately forge the global solidarity needed to bring that new world into being. 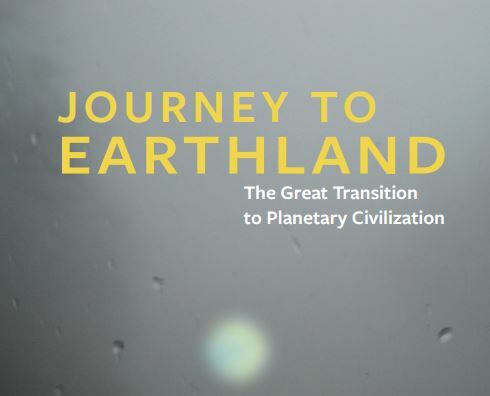 ‘Journey to Earthland’ is a recently released book by the Great Transition Initiative (GTI), a worldwide network of activist scholars with a unique purpose—to advance “a vision and praxis for global transformation”. Few civil society organisations have such a broad focus on transformational strategies towards a new global social-ecological system, as condensed and overviewed in this latest publication by GTI’s director, Paul Raskin. The short and accessible book presents a majestic overview of our historic juncture and expounds the urgent need for systemic change, with a hopeful vision of a flourishing civilisation that has long inspired Share The World’s Resources (STWR) in our complementary proposals for peaceful mass civic engagement. The phrase ‘Earthland’ adopted by Raskin relates to the Planetary Phase of civilisation that GTI conceptualise as the coming era, in which humanity embraces its increasing interdependence through a new ethos of global solidarity and a transformed political community of cooperative nations. With the first part of the book summarising the evolving phases in human history since the earliest dawn of man, the Planetary Phase is finally “born of systemic crisis”, requiring a corresponding systemic response that can shape an inclusive and sustainable future for all. Earthland is the idealised outcome of this great transition, brought to life in the final part of the book where three archetypal regions are explored: Agoria (with its market emphasis and socialised economy, or ‘Sweden Supreme’), Ecodemia (distinguished by its economic democracy and collectivist ethos), and Arcadia (accentuating self-reliant economies and a ‘small-is-beautiful’ enthusiasm). Raskin argues that such a compelling vision of “One World, Many Places” may seem remote, but should not be dismissed out-of-hand—just as the idea of sovereign nations may have once seemed an implausible dream. Central to the book’s thesis is the question of collective action, and the need for a “vast cultural and political arising” that can bring this new world into being. The rationale for a new form of global citizens movement is made throughout the book, drawing upon much of the analysis and propositions in GTI’s canon. It is the missing actor on the world stage, an overarching systemic movement that includes all the many struggles for peace, justice and sustainability, yet remains united under a broad umbrella of common concerns and universal values. Raskin and the GTI make a convincing case that such a movement may be our only hope of avoiding a “Fortress World” or “Barberisation” future, as long as a movement for a great transition can fill the vacuum in political leadership and lay the foundations for a “post-growth material era”, and a true “global demos” or “planetary democracy”. From STWR's perspective, the book hits all the right notes in sketching out a more equal and vibrant civilisation that exists within planetary boundaries. It envisages a new paradigm in which economies are a means for attaining social and environmental ends, not an end in themselves; in which economic equity is the prerequisite in a shift towards post-consumerist societies, while poverty elimination is “a galvanising priority”; and in which continued economic growth is equally shared both within and between regions, until Global North-South disparities have vanished. In the imagined social dimensions of Earthland, we also find a more leisured society where everyone is guaranteed a basic income, and where the pursuit of money has given way to non-market endeavours that enable genuine “sharing economies” and the art of living to flourish. Raskin even outlines the new modes of trade and global governance for a Commonwealth of Earthland, including world bodies that marshal “solidarity funds” to needy areas, thus ensuring a truly communitarian and interdependent economy. The real question, however, is how a global citizens movement can actually emerge in these socially polarised times, when even the prospect of uniting Western societies to welcome refugees is a forlorn challenge. Raskin provides a cogent theoretical perspective on how a mass movement can be galvanized, built on cultural or “normative solidarity” and a sense of “emotive unity”. Emphasis is placed on the need for proactive organising strategies, as well as an “integrated strategic and intellectual framework” that can connect the full spectrum of global issues. The times cry out, writes Raskin, for large-scale campaigns with the explicit purpose of catalysing a transformative social movement along these lines. But still we await a truly international effort of this nature to emerge, while most single-issue movements are increasingly entrenched in local or regional struggles as the trends of inequality, conflict and environmental degradation generally worsen. This is where STWR’s advocacy position departs from the GTI, despite fundamentally agreeing with their broad analysis and vision for a consciousness shift towards a Planetary Phase of civilisation. To be sure, the greatest hope for the future rests with new solidarities being forged on the global stage, with the welfare of the collective whole being prioritised above the welfare of any one particular group, class or nation. But what does this actually mean in the present moment, when discrepancies in global living standards are so extreme that millions of people are currently at risk from dying of hunger or other poverty-related causes, while 8 billionaires own more wealth than the poorest half of the world? Furthermore, is it realistic to expect the 4.3 billion people who subsist on less than $5-a-day to join a global citizens movement, if their basic socioeconomic rights are not at the forefront of any such planetary endeavour? From this immediate perspective of a starkly divided world, the answer for how to catalyse a united voice of ordinary people may be unexpected in the end. For perhaps what’s missing from most Western-led campaigning initiatives and protest actions is not the right intellectual strategy, but a sufficient focus on the hardships and suffering experienced by the very poorest citizens within the world population. Perhaps the spark that will initiate an unprecedented demonstration of global unity is not to be found in the human mind at all, but in the simple attributes of the human heart—as Raskin himself appears to intuitively recognise. He writes: “As connectivity globalizes in the external world, so might empathy globalise in the human heart.” The question that remains is: how can that collective empathy be initially catalysed, and on what basis—given the fact that tens of thousands of people are needlessly dying each day without sufficient help from governments or the public-at-large? This is the starting point for STWR’s understanding of how to unify citizens of the richest and poorest nations on a common platform, based on the awareness of an international humanitarian emergency that our mainstream Western culture tends to largely ignore. Hence our proposal for enormous, continuous and truly global demonstrations that call upon the United Nations to guarantee Article 25 of the Universal Declaration of Human Rights—for adequate food, housing, healthcare and social security for all—until governments finally commit to an emergency redistribution programme in line with the Brandt Commission proposals in 1980. As STWR’s founder Mohammed Mesbahi has explicated in a different kind of political treatise titled ‘Heralding Article 25: A people’s strategy for world transformation’, such unprecedented protests across the world may be the last chance we have of influencing governments to redistribute resources and restructure the global economy. It may also be the only hope for initiating a global citizens movement, bringing together millions of people for a shared planetary cause—and ultimately paving the way for all the social, economic and political transformations that are inspiringly promoted by the GTI. Report: When will ordinary people rise up?